I concur with Dean, if we do not make it a priority to share accuract information, then we can accurately be accused of being “fake news” and we will have no more credibillity that CNN or MSNBC. However, after watching Dean’s account, in the video, I have grave concerns regarding his allegation as offered in the video. I was provided a list of documents loosely entitled “… 2025 Owning the Weather…The Weather As a Force Multiplier.. The Manufacturing of Earthquake Causing Weapons” which details how the Air Force has long planned to enact earthquakes, hurricanes and other weather phenomena to bring part of any country to its knees. I am still processing these articles, however, at the conclusion of the article, I will post a copy and paste an Air Force document which details how earthquakes can be used as a weapons. There are strong implications that have come to me from multiple sourcess which speaks to the fact that Martial law (i.e. Continuity of Government) will be declared and the real agenda of using a false flag weather event would be acted out. A review of Nick Begich’s work on weather modification provides undeniable proof that the technology exists and has been patented and is hiding in plain view. In his book, Angels Don’t Play This HAARP, Begich presents 12 patents that prove that the Air Force has the capability to alter weather systems. The 12 patents, listed in Begich’s book, described ideas which were originally controlled by ARCO Power Technologies Incorporated (APTI), a subsidiary of Atlantic Richfield Company, one of the biggest oil companies in the world. APTI was the contractor that built the HAARP facility. ARCO sold this subsidiary, the patents and the second phase construction contract to E-Systems in June 1994. E-Systems is one of the biggest intelligence contractors in the world as the work for the CIA, defense intelligence organizations and others. $1.8 billion of their annual sales are to these organizations, with $800 million for black (secret) projects. Often, these projects so secret that even the United States Congress isn’t told how the money is being spent. E-Systems was bought out by Raytheon, which is one of the largest defense contractors in the world. In 1994 Raytheon was listed as number forty-two on the Fortune 500 list of companies. Raytheon has thousands of patents, some of which will be valuable in the HAARP project. The twelve patents below are the backbone of the HAARP project, and are now buried among the thousands of others held in the name of Raytheon. Bernard J. Eastlund’s U.S. Patent # 4,686,605, “Method and Apparatus for Altering a Region in the Earth’s Atmosphere, Ionosphere; and/or Magnetosphere,” was sealed for a year under a government Secrecy Order. The article recounts an offer by the Russians to aid Malaysia to create a typhoon to dissipate a pall of smoke that hung over the country, and still does, caused by the burning of large sections of the rain forests in Indonesia and Sumatra. The following link etablishes that the Air Force not only has the capabiiity to manufacture a hurricane, but they can manufacture earthquakes as well. Here is a partial excerpt to the Air Force Owning the Weather 2025 and like most intelligence, it is open-sourced and it is readily available if one knows where to look. This technology abstract is a submittal by the general public. The views expressed in this abstract are strictly those of the author and do not reflect the official policy, position, or programs of the United States Air Force, Department of Defense, or the United States Government. DISTRIBUTION A. Approved for public release; distribution unlimited. Description: Ultrasonic or acoustic weapon to destroy runways, buildings, bridges. Weapon will generate a very strong acoustic wave that causes structures to resonate, and thereby destroy them. This has the advantage of being a destructive force that is not designed to kill people. There are reasons that Americans should be very concerned. Is this the beginning of a series of attacks upon our people and property? At the very least, we have to be concerned. 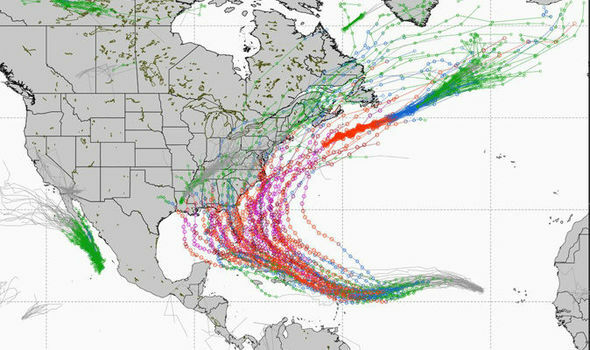 The evidence clearly shows that the technology exists to do what has been alleged, namely, Hurricane Harvey was a manufactured event and that Irma is falling into the same “irregular pattern” of weather anomolies. Here are some questions to ponder if these allegations are true: (1) What is the end-game motive? and, (2) Who is ultimately behind these attacks?